Priya Chandrasekaran didn’t know what to expect when she left India for the United States just a few days after getting married in June 2010. Because she came to the U.S. on an H-4 spousal visa, Chandrasekaran was unable to apply for jobs that would not sponsor her for her own work visa. Frustrated with her inability to build a career, she found herself growing increasingly unhappy. “I kept saying: ‘We are moving back. I want to move back so that I can go back to work,’” Chandrasekaran, who now lives in Seattle with her family, said. But Chandrasekaran's life improved once she was authorized for employment in 2015 after the Obama administration issued a rule that allowed those on spousal visas to work if their spouse was applying to become a lawful permanent resident. According to the U.S. Citizenship and Immigration Services, there have been close to 91,000 initial approved applications. H-1B visas and H-4 employment authorization decisions are generally renewable. Now, as the Trump administration considers rescinding that decision, Chandrasekaran is one of many H-4 visa holders who are now concerned that their ability to work might disappear. In February, the Office of Management and Budget received a proposed regulation from the Department of Homeland Security about the future of work authorization for H-1B spouses. The proposed change would strip employment authorization from the spouses of H-1B visa recipients. “No decision about the regulation concerning the employment eligibility of certain H-4 spouses is final until the rule-making process is complete,” a USCIS spokesperson told NBC News in February. Claire Pratt, an immigration attorney at Jewell Stewart & Pratt in San Francisco, noted that most employment authorization holders are from India and China, countries with immigration backlogs of at least a decade for those applying for permanent residency. 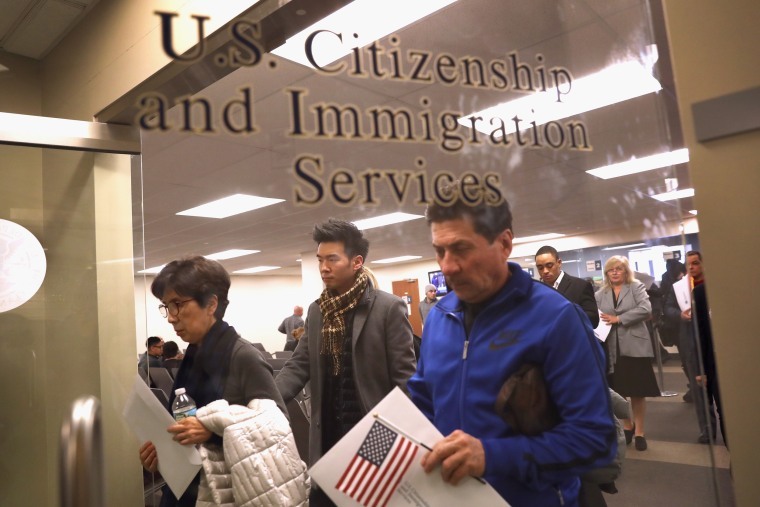 Because the future of the work authorization for spouses is unclear, many visa holders have been working to bring employment authorization and the visa backlog to the public's attention. So Kumar and others began to come together and strategize. But in addition to the desire of many spousal visa holders to work because of their careers, Kumar noted that many of the families that Save H4EAD has connected with have also stressed the high cost of living in tech hubs. Grateful to Hon Reps .@BetoORourke . @RepEBJ for your resounding support to issues faced by skilled legal immigrants. A survey conducted by Save H4EAD of its members found that the average employment authorization holder in Save H4EAD is a woman about 32 years old who has lived in the United States for at least five years. Members also tend to be highly educated, with almost all of the 2,411 surveyed having a bachelor's degree and 60 percent a postgraduate degree. “The H-4 EAD has allowed them to make life-changing decisions,” Kumar said. Meghna Damani first moved to State College, Pennsylvania, to join her husband in 2002 after they were married. She was unprepared for the restrictions on working. But the reality of life on a spousal visa turned out to be very different. Damani soon found that there were few employers willing to sponsor her for the proper work authorization. As she continued to fruitlessly look for work, she found herself struggling with depression and feelings of social isolation. “It was just hard to be outside of society,” she recalled. Damani would channel those feelings while taking courses in documentary filmmaking. Her 2007 documentary, “Hearts Suspended,” delved into the lives of women on spousal visas in the United States. Now a U.S. citizen, Damani is working on a follow-up exploring the lives of visa holders with employment authorization. In addition to the concern that they would not be able to work, an even bigger worry for Chandrasekaran and other families reliant on employment authorization is what would happen if the option to work was suddenly taken away. Now the mother of two sons, 2 and 7, Chandrasekaran wonders how she will plan for extracurriculars and her children’s college funds. H4EAD program has provided thousands of skilled legal immigrant women, the chance to dream, aspire and achieve, while they remain stuck in decades long greencard backlogs due to broken immigration system. “If the EAD goes away I think there will have to be choices on whether we’ll stay here or not,” she said, adding that she and her husband bought a home and had their second child after she began working. While the exact language of the new order has not yet been released, many visa holders are already assessing their options. According to Pratt, the immigration attorney, one path to continued work authorization is to see if a current H-4 holder can get a nonspousal visa of their own. “One of the most obvious solutions is to find an employer who is interested in sponsoring them for an H-1B, but of course they would have to go through the lottery,” said Pratt, adding that meant the worker would then have to face the backlog themselves. In 2018, there were 190,000 applications for 85,000 total spots. “It is not something that is available to everyone — everyone can apply, but not everyone is going to get it,” Pratt said. In recent years, H-1B visa holders have been working to change the conversation when it comes to both the visa backlog and the impermanence that the uncertain nature of the visa creates. A need for that awareness is what inspired Rishi S. Bhilawadikar to release his debut feature film, “For Here or to Go,” in 2017. At the time, Bhilawadikar told NBC News that he hoped the film would highlight the many tech workers who spend their prime earning years working on a restrictive visa. But as visa holders and activist groups wait for the language of the new guidelines to be released, Bhilawadikar says his conversations with young Indians thinking about coming to the United States has drastically changed. He has personally seen friends worried about the future start to look at moving to places like Canada or other countries with less restrictive policies. “My bottom line is, don’t do it,” Bhaliwadikar said of moving to the U.S. "It's not worth it."